I’m an easy person to spot at meetings. While everyone else is dutifully tapping away at their iPads, I’m still scribbling down notes with pen and paper like a 20th century chump. It’s not that I’m a luddite, but after trying out a parade of note-taking apps for the iPad, I’ve just never found anything in the digital world that matches handwritten notes. Livescribe says I’m not the only one to feel this way. According to the digital penmaker’s internal research, roughly two-thirds of smartphone and tablet users still prefer pen and paper for jotting down notes in meetings, lectures, or whenever they’re on the go. But the company thinks its latest offering will be the one that causes us holdouts to cast aside our old-school pens for a digital counterpart. The company’s latest smartpen, the Livescribe 3, goes on sale Monday online, with the pen arriving in stores next week. In addition to a slimmer design, the Livescribe 3 promises tight integration with the iPad, iPhone, or iPod touch, thanks to a just-released iOS companion app. Previous pens from Livescribe were more desktop-centric, says Bryan Rodrigues, the company’s vice president of marketing and e-commerce. But pens like Livescribe’s Pulse and Echo hit the market before the proliferation of mobile devices. The Livescribe 3 takes a much more iOS-centric approach. “People are taking to the road with a notepad and an iPad and trying to get more out of that,” says Rodrigues, pitching the Livescribe 3 as the third piece of that puzzle. The Livescribe 3 is an actual pen, of course, that sets down physical notes in actual ink. But pair the smartpen with Livescribe’s Dot Paper notebooks, and the pen keeps a digital record of every pen stroke. The tip of the Livescribe 3 contains a camera that’s capturing what you write, allowing the pen’s companion software to search through your text of find specific words in your handwritten notes. 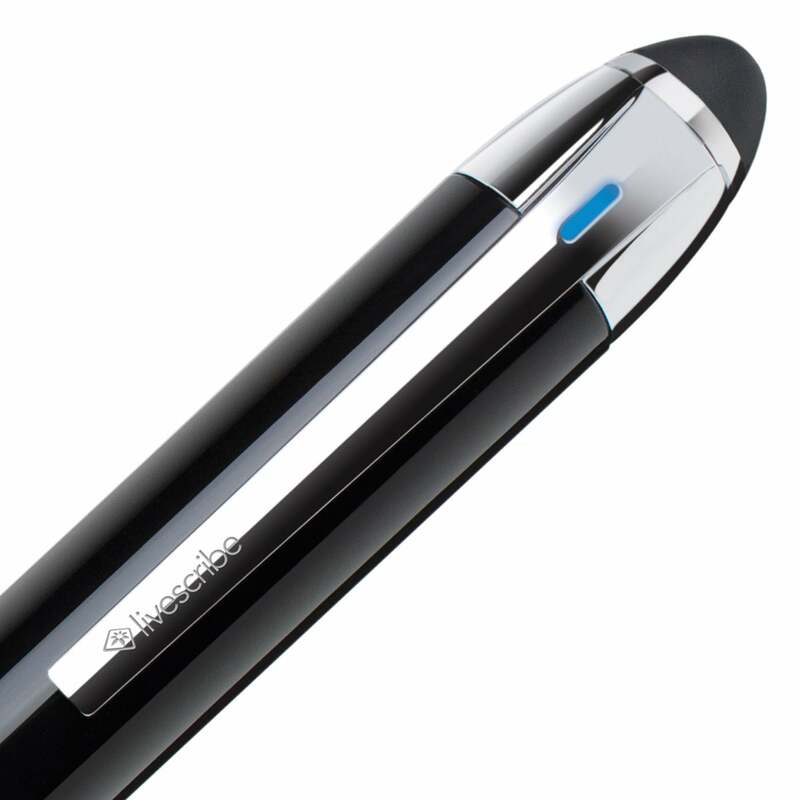 “It’s a writing gadget that looks and feels like a writing implement,” Rodrigues says. Remove the rubber cap on one end of the Livescribe 3 smartpen to get to its charging port; that cap also doubles as a capacitive stylus. It’s also a writing gadget that boasts some impressive battery life—about 14 hours of active writing on a single charge, according to Livescribe. The Livescribe 3 is able to last that long thanks to its use of Bluetooth Smart, a low-energy version of the wireless connectivity standard that connects the Livescribe 3 to your iOS device. When you’re running on juice, just flip over the rubber cap on the top of the Livescribe 3 to get to the Micro-USB charging port. An LED indicator gives you an at-a-glance look at the Livescribe 3's status. This blue light means it’s connected via Bluetooth to your iOS device. That rubber cap happens to be one of a number of clever design features built into the Livescribe 3: The cap doubles as a capacitive stylus that you can use with your mobile device. Don’t expect to do the kind of elaborate sketching you’d produce with a dedicated mobile stylus, but for tapping your iPhone or iPad screen, it should do the trick. A series of LED lights on Livescribe 3—green when the pen is turned on, blue when it’s connected via Bluetooth, red if you’re recording audio to store on your iOS device—keep you apprised of any status alerts. There’s even a Find My Pen function where the Livescribe 3 lets out a little beep to help you locate it on your desk or in your travel bag. Flip over a block of handwritten notes in the Feed view of the Livescribe+ app, and you can convert it into text. The Livescribe+ app can display notes in your handwriting; you can also convert that into digital text. The app’s Feed view cuts up notes into blocks of writing; flipping one of those boxes over converts it into digital text, which you can then edit to your heart’s content. Once your notes are in digital format, you can use them to create reminders, contacts, and calendar appointments or copy and paste into other apps. Livescribe+ also recognizes phone numbers and URLs, so tapping on those will either initiate a phone call or launch a webpage. “There's multiple ways to do everything, so you can find the way that suits you,” Rodrigues says. The app also lets you organize notes by tagging them, highlighting them as favorites, or flagging them. It’s a simple matter of tapping on the appropriate Tag, Favorite, or Flag icon on Livescribe’s Dot Paper notebook, and the corresponding note will be categorized in the Livescribe+ app. Play back a pencast you’ve recorded with Livescribe+, and the app highlights the relevant portion of your notes in green as the audio plays. You can also record audio with the Livescribe+ app, creating what the company calls “pencasts.” Audio recorded via the app is synced to what you’re writing down. When you play back the audio, Livescribe+ highlights the relevant section of your notes. Other features of the Livescribe+ app include the ability to add pictures, text, and captions to your notes. You can share notes from Livescribe+ as PDFs with any service or app that supports PDFs, including Evernote and Dropbox. You’re able to share pencasts as well, though anyone you share with will need to download Livescribe+ themselves to use the audio playback features. The app is currently only available for iOS devices due to Apple’s support for Bluetooth Smart. This summer’s Android 4.3 release added native support for Bluetooth Smart, and Livescribe plans to add Android support in 2014 as more devices adapt the low-energy connectivity feature. The Livescribe 3 comes in two editions. The $150 standard edition features the new black-and-chrome smartpen, a 50-sheet Starter Dot Paper notebook, a replacement ink cartridge, and a Micro-USB cable. The $200 Livescribe 3 Pro Edition features a darker shade of chrome and includes a leather smartpen portfolio, a 100-sheet Dot Paper Journal, the replacement ink cartridge, and a Micro-USB cable. In addition, the Pro Edition features one year of Evernote Premium (normally $45) for free. In addition, Livescribe also sells Dot Paper notebooks and journals in a variety of sizes, with prices ranging from $9 to $25. The company offers replacement ink cartridges as well, and will list other standard-sized ink cartridge brands that work with Livescribe pens on its website. Article updated at 1:51 p.m. PT to clarify that the red light means audio is being recorded and stored on your iOS device.